When I was younger I used to watch my mom and her sisters hang art in their homes. It was always an occasion when one of them wanted to redecorate and finally hang their wall art. They used to all gather at whoever's home was changing things around and over a cup of coffee, share opinions on just how the art should be hung. Not too high, not too low, never in the center of a room. It was fun to watch it all happen and I suppose some of their opinions rubbed off on me, as I always find myself silently critiquing the way art is hung. So when the folks at Society 6 asked if we'd be interested in curating a gallery of wall art, myself and our art-deprived walls jumped at the chance. 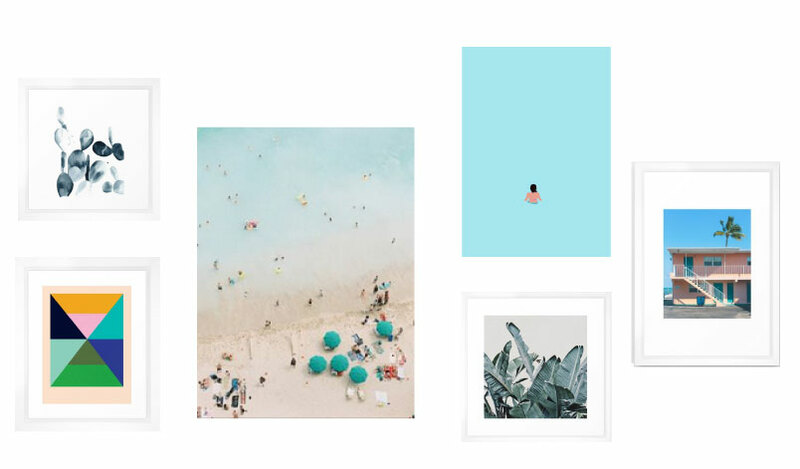 We've always been big fans of Society 6 and their artists and we love that you can not only order your prints from them, but that you can choose to get them framed as well or even order canvas versions. With this project we ordered both and were impressed with the quality, and it was super easy! There are a few guidelines we go by when selecting art for our walls. Although in many cases, art is a personal choice; sometimes it can be a difficult process even for the well-seasoned decorator. 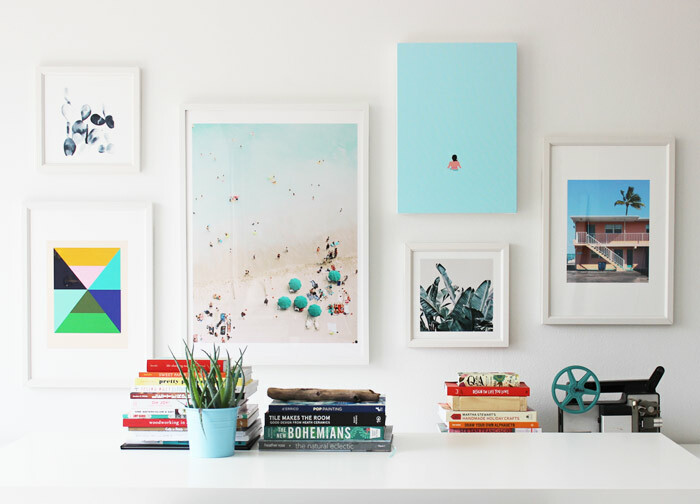 Here are a few tips if you're struggling curating and hanging a collection. This has to be the number one reason right? The piece has to speak to you and it's a great starting point. Like our gallery above, we were really attracted to The Islands of Waikiki by Ashley Goodwin and this print became the theme to our gallery. If you haven't found a print you love. Find a theme. Art is supposed to be inspiring. It should be something that makes you feel something, and make your space a better place. Quoting interior designer, Mary Burgers "some rooms just make you want to be that better version of yourself". So if there's something that lifts you, like in our case, the beaches of Hawaii, then that's a good place to start. I like the idea of being on vacation, and when I can't, perhaps bringing that feeling into our home will bring an easy, breezy feel to our every day. From our main piece (the beach picture), we pulled in pieces, as if we were walking from our hotel to the beach, and then into the water. Pink buildings, tropical foliage, a bright graphic wall along the way, a nice beach with warm waters and an afternoon dip. An obvious consideration, but sometimes not so easy to do. Think about the size of the wall the art will hang and the entire space within the room. A good guideline is, if it's a small wall, then go for the correct scale. Don't pick too large, nor too small. Think about furniture placing and where it will be within those restrictions. 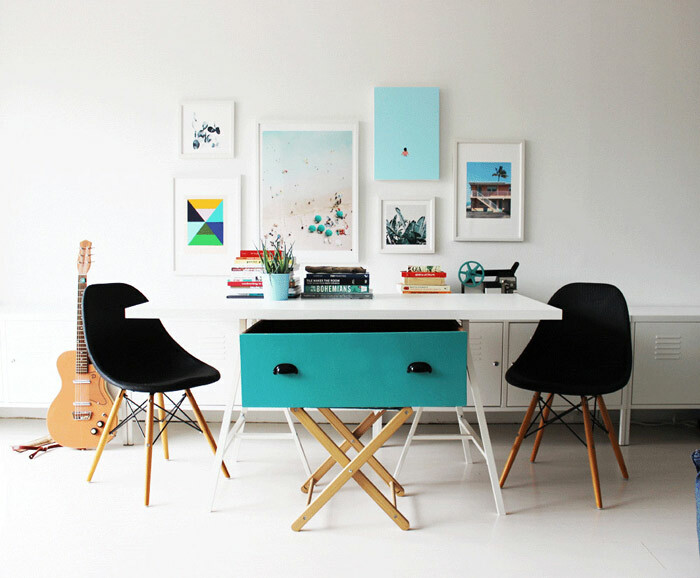 Just as you wouldn't mix clashing colors together with your textiles within a room (unless you're going for a bohemian look); the same with art within a room. Another obvious consideration, but if you happen to be choosing a collection of pieces together, it's nice to have that perogative. You'll notice in our collection the color blue is a recurring theme. From the dark blue green hues in the paddle cactus and banana leaf prints through to the turquoise blues of the water and graphic canvas, each compliments the other creating a really nice flow throughout the collection. Although not always the case, to add interest to a gallery, it's nice if you can mix things up from different sizes as well as the medium like photography, illustrations, paintings and graphics. Or the other option is to go with all the same size, or all the same type of medium (eg. 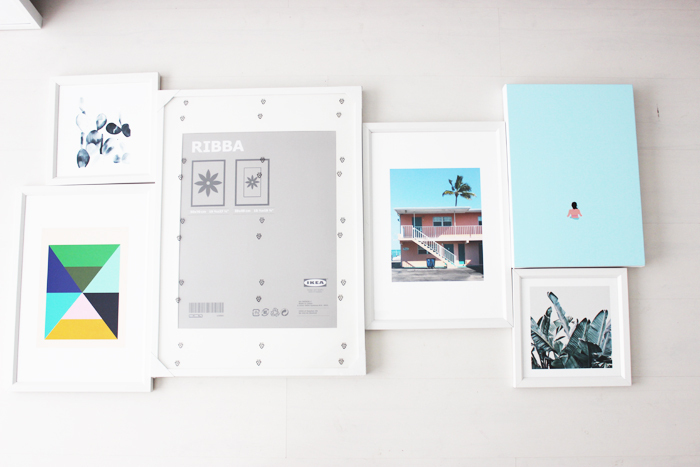 all black and white or all colour photograph), and all the same types of frames. This also works. If you are starting a gallery from scratch, one way to look at buying art is to digitally create your gallery first. This is a great way to look at your collection of all of the pieces together. We did this with ours (see below image) where we placed all of the images together to look at as a grouping. It's super easy to do on your desktop. Just create a new folder on your desktop, save the images of the art from the online shop onto your desktop and then drag them into the new folder. Open up the folder and you can then mix and match within the folder by clicking with your mouse and dragging them into place. This will give you a good general idea if the pieces you chose really look well together. Another way is to use an app like Adobe's Illustrator (if you're familiar with it) which also allows you to manipulate the sizes of each piece to get a more realistic viewpoint. 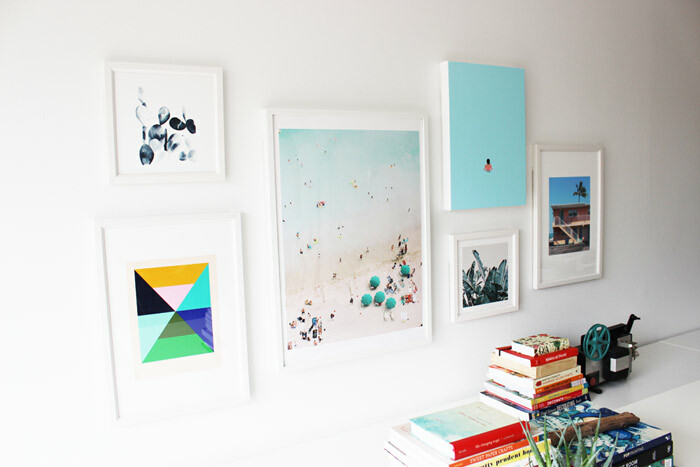 There are many sources for hanging art for a gallery style wall. From cutting out different sizes of paper for each image, to placing your art out on the floor and covering it with wax paper and then tracing out each piece. 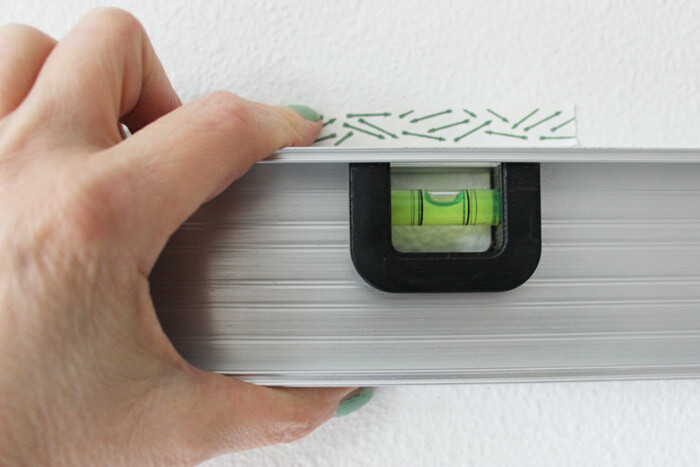 All are great ideas, but we love simple and our method of using a level and a ruler works like a charm, especially if you don't have a lot of time. Pro tip: We like to use picture hanging strips, which are basically made with a sticky (damage-free) side and a velcro side. One side for the wall, the other for the picture. They work really well and if you make an error, you can easily remove it and move it. We like to create our basic layout of our art first. Lay it all out on the floor, (below to where it will be hung if possible) mixing and switching until you've found the perfect layout. Once you have the basic layout, create a space (approx. 2.5" to 3" for larger pieces and approx. 1 to 1.5 for a smaller gallery) in between each framed piece. Then measure using a measuring tape from one end to the other. 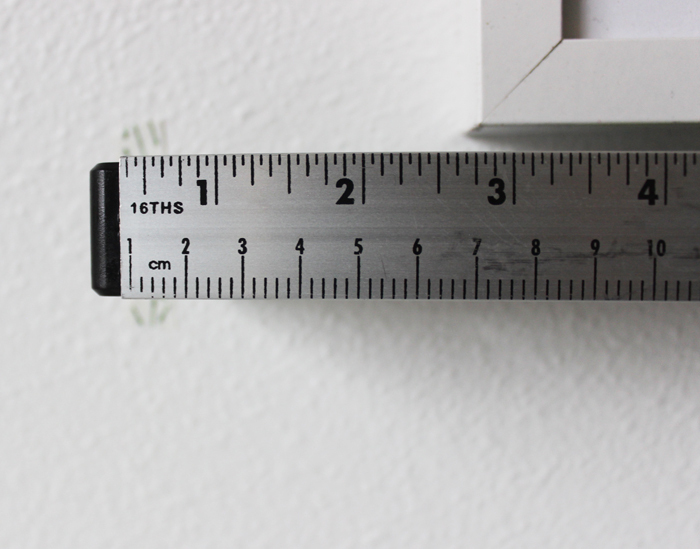 This measurement you will use to align where your art will hang on the wall. Using an erasable pencil, tick a mark at both ends on the wall. Depending on the wall and the size, but the general guideline we like to use is, lower is better than higher. A gallery of work should generally be at eye level or just a little lower. In most cases, art should never be hung higher than eye level unless it's above a shelf or something that is already at eye level. As before where we measured left to right, now measure your pieces on the floor, top to bottom. Using an erasable pencil, tick a mark at both top and bottom heights on the wall. Create a rectangle of the two axis (vertical and horizontal) using masking tape (making sure that the masking tape line is straight using your level). From there also measure and mark the center with a small piece of masking tape. To make this easy, choose the image that is closest to your center. Depending on where it falls near the center (left, right or center), align to your center mark per your layout on the floor. Take your level and place it on top of the frame and align your picture until straight. Mark the top of the frame with masking tape. Hang this first piece. Now work your way out from each side, measuring the ( 2.5" to 3" or 1" to 1.5") allowance space you measured before on both sides (use masking tape to mark these). Then align the next picture, hang and so on. See our example images below. And that is it! You don't even need a helper! Although it is nice to have someone around to throw ideas around with and share a nice cup of coffee while you're at it. Click here to see more favorite collections we love from Society6. Originally appeared on the Society6 blog. Thanks Cinthia - hope they are helpful!